Dark chocolate that is! Dark chocolate is known to be associated with a variety of health benefits. Who knew something so decadent could be good for you? 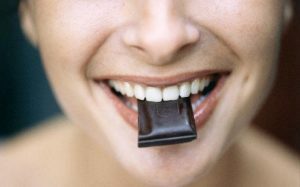 Some studies have also suggested that dark chocolate can help prevent cancer; however, this evidence is limited and more robust studies need to be conducted. 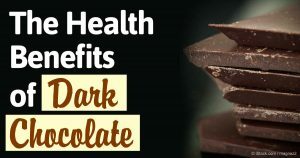 I would never suggest that dark chocolate be a replacement for appropriate medical treatment of your high blood pressure, obesity or elevated cholesterol, but what I do suggest is that consuming dark chocolate in moderation may be a good thing. Or, if you are about to go into a big meeting or need to make an important speech and want a little boost in brain power, eat some dark chocolate. Next time you are at the grocery store, treat yourself to dark chocolate (Dove is my personal favorite) and enjoy!